Need to use your first-party data to create tailored audiences but fear to lose control over it? The ShiftForward Private DMP gives you the power to bring your data to the next level and lets you reach potential customers accurately, all the while keeping it safely on your side. Be it from CRM, desktop, mobile or whatever other source you’d like, online or offline, the ShiftForward Private DMP lets you bunch up as much data as you want, under your own premises. Intersect the common denominators to safely connect the dots between online users and offline records, thus creating the most complete user profile. Gather your profiles and turn them into audiences according to your needs thanks to the ShiftForward Private DMP’s flexible segmentation feature. You can now seamlessly target the most accurate audiences across every channel. The ShiftForward Private DMP improves recommendations and retargeting in real-time . Your data, your audiences, your decisions, under your roof. Your marketing department needs to sharpen up its strategy. Namely, you need to target campaigns more accurately since your recent customer growth means a much wider audience, therefore a need for a more specific marketing strategy. You have a bunch of unstructured customer data coming from various sources and you sure hope to find a good use for it. The thing is data comes in various forms and from various sources: you have your CRM for socio-demographic data and then ad impressions data coming from display and mobile, and then you have e-commerce interactions, and then your e-mail marketing platform gathers open and clicks. There has to be an easy way to safely keep all of this in the same basket while making some sense out of every single one of these interactions. The Private DMP can help with that. It is the easy, holistic way to concentrate all your resources in the same place and make them communicate so you can track each customer from every source. And now that you have the most complete customer profile possible, you can reach them in the most complete, accurate and profitable way. 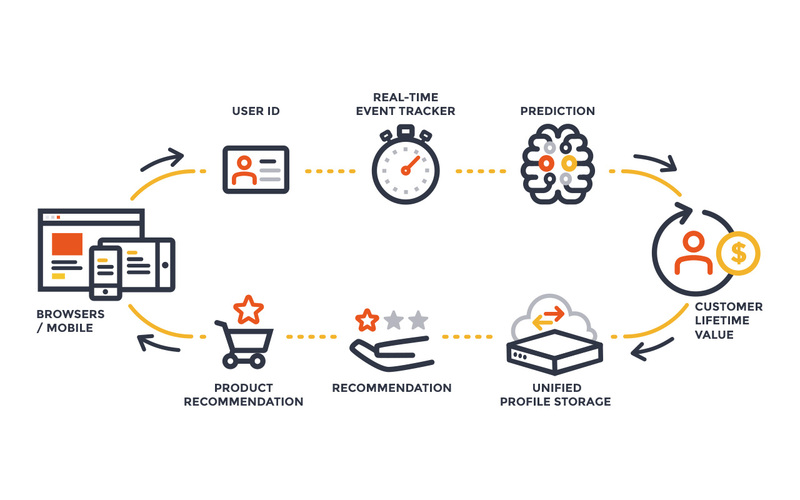 Put our machine learning algorithms to good use: use them to predict the Customer Lifetime Value of your users and to optimize your e-commerce recommendations around it.